My yard is wildlife friendly, as much as possible. If you are a hunter, I don't want to hear about anyone hunting these birds (Mourning Doves) because they are very precious to me. So, I'm hoping I can get the photos posted as this is the first time I've posted any photos to the forums here. Wish me luck! Congratulations cheshirecat ! Wonderful photos. I have a lot of mourning doves in my yard that just sit around but I've never seen a nest. I like the whirring sound they make when they take off and their seemingly gentle nature. Aren't they lovely :O). There is nothing like the sound of mourning doves at dusk. One of my favorite little birds. I have my wildlife rehab license and take in the occasional creature in need. We had a pair of mourning doves that had been injured by a cat attack (or so thats what the vet thought had happened.) Ozzy had a broken wing, and Harriet had a bad leg, so they couldn't be released, but they lived out the rest of their lives with us, and I think they were just happy to stay together. I have a special place in my heart for the little guys. How many little ones did you have hatch? Great pics! The first time there were two babies. The parents tried again and only hatched one baby out of two eggs. 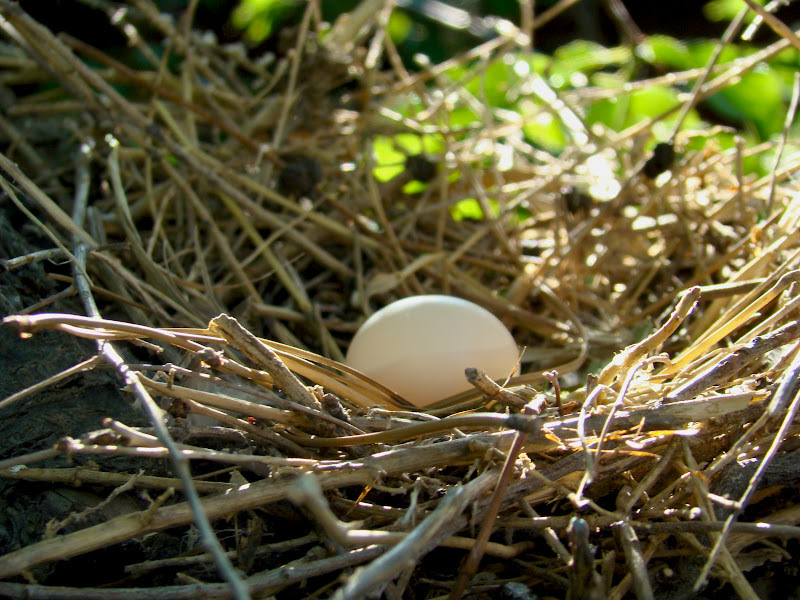 When the baby began flying, the parents abandoned the nest and one egg was left behind. Mourning Doves can have three broods from Spring to late summer so I am watching to see if they try again. So far, no. I still hear them cooing in the trees around my house and am glad they are in the neighborhood. I'd really like to see a robin nest in our yard. I love attracting and watching the birds in our yard. The most active time is in early spring as the migratory process is underway. My yard has lots of open space and transition areas nearby. We have mixed forest of both dry lands and swamp. We also have a large planting of fairly mature pine trees on our 130-140 acre family homeplace. I have always been amazed at the numbers and species of wild birds that frequent here. Probably is related to the variety of growth that is adjacent to the home site. We frequently see about half a dozen kind of wood peckers, from the large pileated, and large red headed, but also including flickers, downy, hairly and red bellied. We have morning doves, whip or wills and nighthawks. Even think that I saw a pair of cukoo's one time, but never sighted them again. We have a variety of owls but rarely see them. Have a variety of hawks including the red tailed and others, plus an occasional osprey. Most years we have nesting crested fly catchers, purple martins overfly but don't nest here, we have about a dozen chimney swifts to nest in the chimney each year. Are visited by dozens or hundreds of goldfinches each year. We frequently see chickadees, tufted titmouse, and various nuthatches. There is always at least one pair of nesting eastern blue birds. See lots of robins, thrush, thrashers, mockingbirds, catbirds, and waxwings. Have nesting wrens and sparrows of varous kinds. Also have many of those non descript tan, yellow, and grey warblers such as Lawrence's warbler, so difficult to identify. We have cowbirds and various blackbirds, blue jays, nesting summer tanager, and an occasional orchard oriole. Always are lots of cardinals and indigo buntings. Have often spotted towhees and slate colored junco. We have regular visits from crows, but they don't seem to do any damage. Have regular overflights of herons, wood ducks, and mallards. This list does not include the multitude of nondescript small song birds that constantly chatter among the large oak trees, nor the many other unidentified birds that fill our yard with activity. IMO is a bird watcher's paradise and something to anticipate every spring. Most every evening, no matter how warm the temperture, the wife and I generally sit on the deck for a while and survey the yard and flowers, and listen to and watch the bird activity of the early evening. Last edited by hendi_alex on Thu Jul 17, 2008 3:36 am, edited 1 time in total. Do birds eat black widow spiders? Or, are black widows poisonous to birds as well as humans/people? I want to see birds in my yard - a lot of them. I like the butterflies and bees too. (Never thought I'd say I like bees in my lifetime.) I tried attending some associations/clubs that are interested in bird-watching, conservation, etc. However, it felt like the emphasis was on technicalities and lists and seeing rather than the passion of feeling and experiencing the lives of birds. Like the thrill I got watching the little dove learn to fly. Mom was nearby but didn't swoop in and rescue the little one that flopped several times against the fence in short staccato flights. Those moments when you wonder about their communication with each other and their fears in those intense seconds of life and survival. With the small size of my yard, I don't think I'll see a large variety of birds like you do Alex, but when I do, I feel like the needle in a very large haystack. I'm a part of their habitat. I bet you feel that way with all the butterflies and birds. So much life pulsing all around you that you can't help but get caught up in it as if you were traversing strands of a web and trying not to get bitten. You gotta take more photos! The black widows are very private creatures that usually only venture out of their dark lairs at night. If I were not so phobic, would likely just leave them alone. But am just too bothered by the thought of hundreds of black widows in the two acres that are maintained as a yard. Rattlesnakes and copperheads don't really seem to care about living in my yard. So on the few occasions that those stray into my habitat, they are simply bagged, taken to the bottom of the hill a quarter mile away, and tossed into the creek/swamp that marks our property line. Doubt that they would ever leave that wonderful area to visit my hot, dry yard again. The black widows on the other hand, just like it here too much and are so very prolific. And if they make it past the juvenile stage, nothing wants to eat them, not even fire ants. We as well, love to watch the life cycle of the birds, and always eagerly anticipate the first flight of the young chimney swifts up and out that two story chimney. Is a wonder that they can make such an ambitious first flight. Also enjoy watching the nesting and feeding of the young, most often of the blue birds in the nesting boxes, or the crested flycatcher and summer tanager. Most nests are high in the canopy or in a limb hollow so the activity can be heard but not easily seen from the ground. Year before last we were able to follow the progress of a basket weaver who had placed the nest in an accessible location. Our dentist's office sits on less than 1/4 acre. He is a nature lover and has constructed privacy fences and constructed bird friendly habitats in each little courtyard formed by the fences. While at the dentist I can usually watch a variety of birds and a squirrel or two, just out the sliding door unti in front of the chair. A small space requires planning and some maintenance but can still be made attractive to quite a number of birds and other critters. Happy a Sunny Day Came and Brought What I Needed!